Kevin's Meandering Mind | The Most Beautiful Day of the Year? The Most Beautiful Day of the Year? Yesterday, after a night of fairly warm temperatures mixed with snow, the world was covered in white and as I drove to the University of Massachusetts for a meeting, I thought: this has to be the most beautiful day of the year. The sun was just starting to come up, and the snow was sticky on the trees, and it was just a breathtaking view of New England. 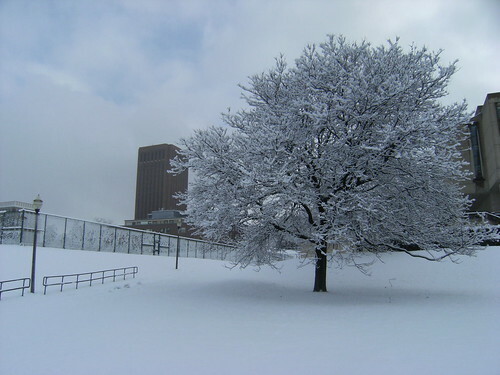 This picture is at the university — the library is in the distance. When I came out of the meeting hours later, the trees were trees again and the moment had passed. Kevin, I agree, this is my kind of weather. Winter lives on here too, and the trees are frosted with a thick coating. Just enough to enjoy more winter skiing. Gorgeous picture! I always love that moment when everything is covered with a fresh blanket of pure, white snow and the world seems quiet and in awe of the sight. Thanks for sharing it with us!